We had some chicken thighs in the freezer and some extra time before dinner, so I whipped this up. 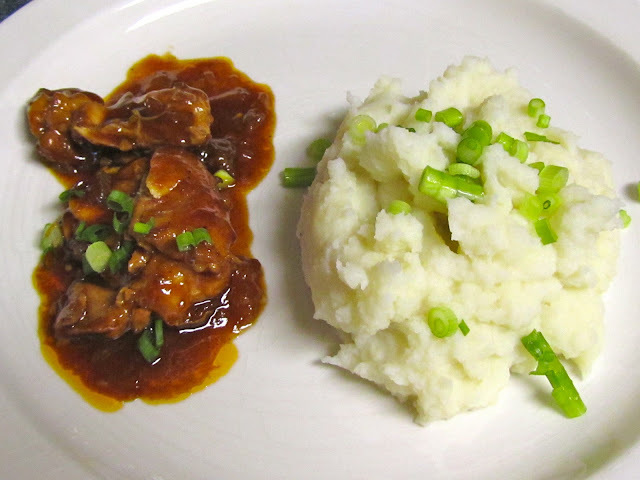 The BBQ sauce was delicious, and I kept spooning it up with the mashed potatoes! I added a little spicy heat to the bbq sauce, with some Sriracha, and it was so tasty! I just used my favorite kind of box mashed potatoes since we don't have any potatoes at the moment. They are perfect for me because they taste just like the real thing, they're easy to make, and free of lumps, which I hate. This is definitely on my list to make again! Here's the recipe adapted from The Pioneer Woman. 2. Heat oil and butter in a heavy pot over medium-high heat. Place chicken thighs, in the pot. Brown both sides, then remove to a plate and repeat until all chicken is browned. 3. Pour off half the grease (do this step, I didn't and the sauce turned out a little too greasy), then return pan to stove. Add onions to pan and stir, cooking for 2 minutes. Pour whiskey into the pot, being very careful if you're using an open flame. Stir and scrape the bottom of the pan, allowing whiskey to reduce for a minute or two. Pour in barbecue sauce, peach preserves, chili sauce, water, and Worcestershire sauce. Throw in garlic cloves. Stir until combined, then return chicken to the pot, skin side up. Cover and put pot in oven. 4. Cook for 1 hour, then remove from oven. 5. Serve pieces of chicken over a big pile of mashed potatoes. Sprinkle sliced green onions over the top.